URTARTE — La Unión Revolucionaria de Trabajadores del Arte (the Revolutionary Union of Art Workers). 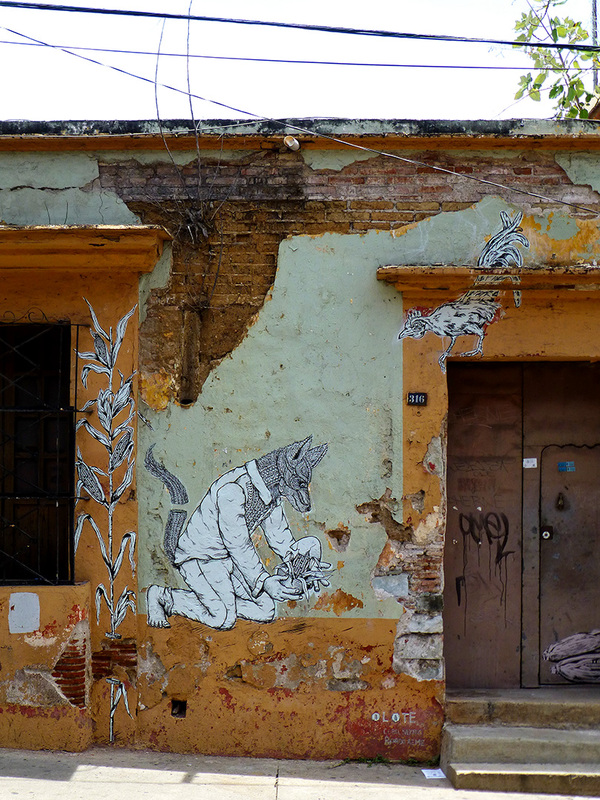 You have no doubt seen their work around the city of Oaxaca. 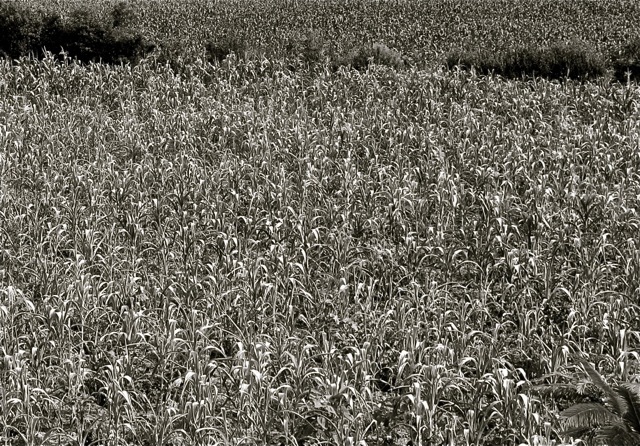 The black and white lines of resistance defending heritage corn from an invasion by the moneyed interests of el norte. 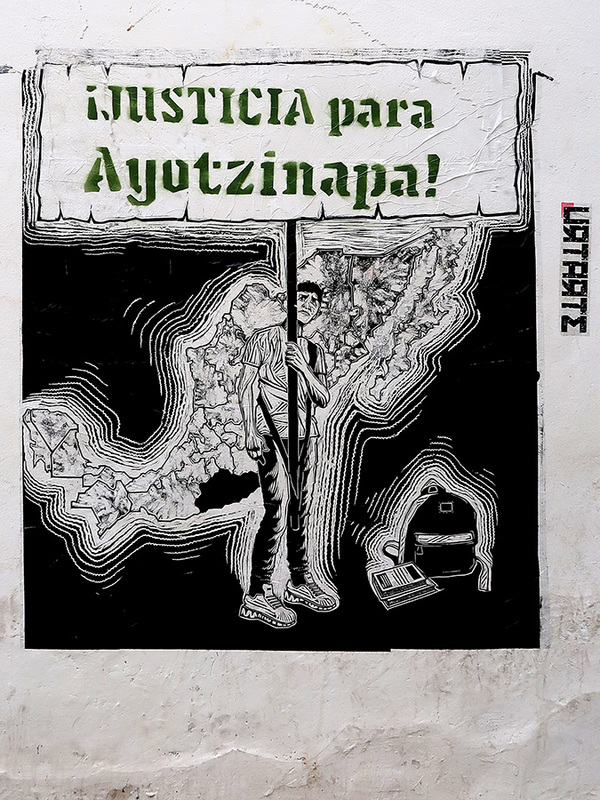 Demanding justice for the 43 student teachers from Escuela Normal Rural Raúl Isidro Burgos in Ayotzinapa, Guerrero — still disappeared after three years. 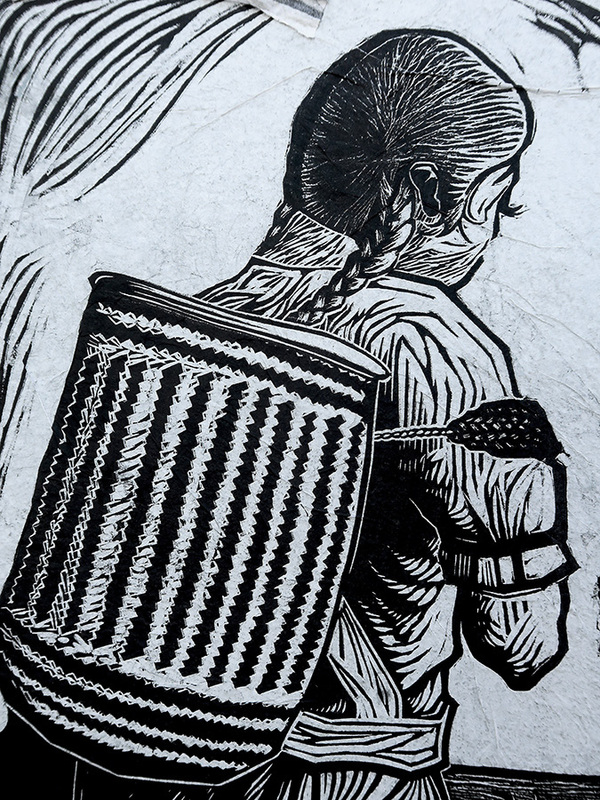 Celebrating the creativity, hard work, and dignity of the women and men living in the villages of Oaxaca. 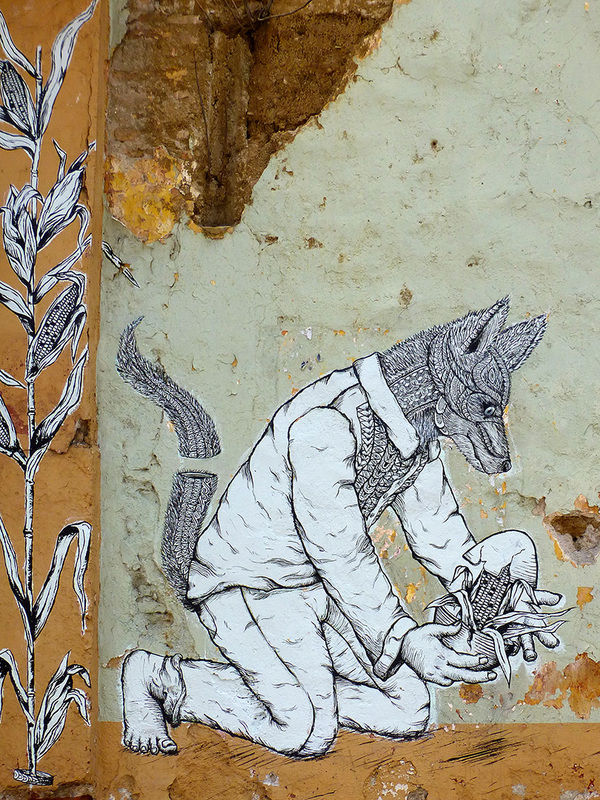 A reminder of the people whose roots run deep into the soil and who make Oaxaca such an exceptional place. 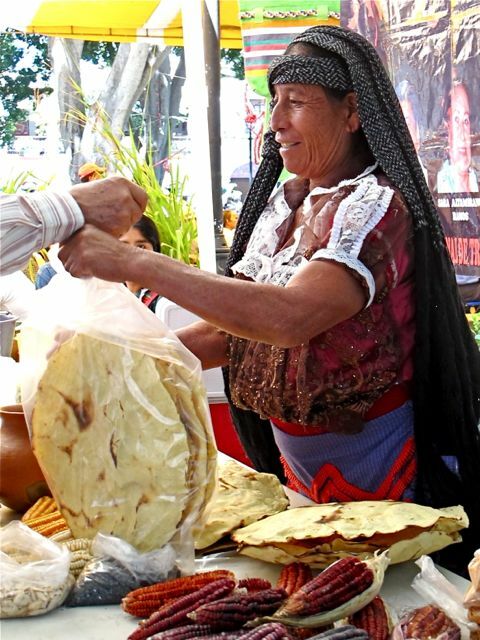 September 29 was Día Nacional del Maíz (National Day of Corn) in Mexico. Corn was first cultivated approximately 8,000 years ago in the valley of Oaxaca and native varieties are still grown by the descendants of those original farmers. 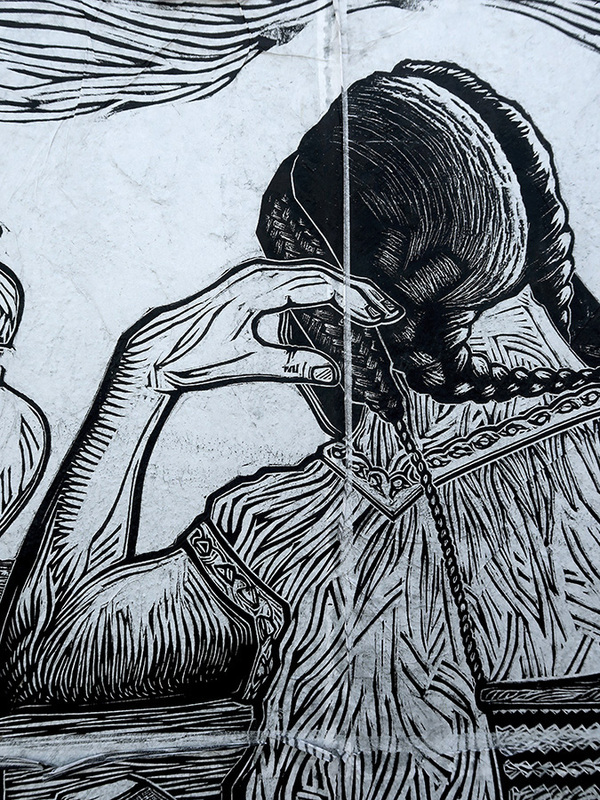 This was a day to, not only pay homage to Mother Corn but, as Mexican painter Francisco Toledo reminded those along Oaxaca’s Alcalá, to continue the struggle to defend native corn against impending invasion by Monsanto and its genetically modified seeds. The year revolves around the cycle of corn, which is planted in the same fields as beans and squash to make a perfect growing environment. The cornstalk grows, the bean plant crawls up the corn, and the squash vine sprawls out and shades the ground to keep it moist… Some of the corn is harvested in August and eaten fresh, while the rest is left on the stalks to dry. All parts of the corn plant are used — kernels, husks (for tamales), cobs (pig feed), and stalks (cow feed). The dried corn is stored and used in many ways throughout the year. Text in italics is from the Seasons of My Heart cookbook by Susana Trilling. 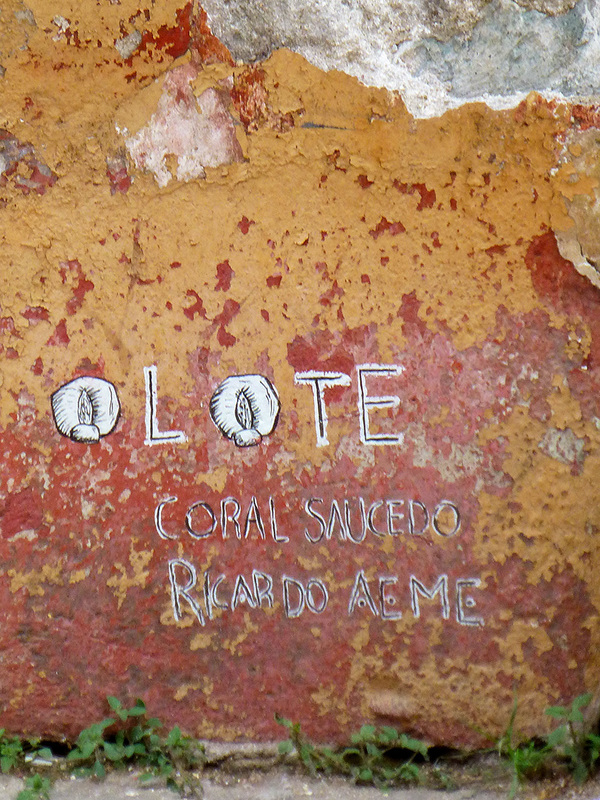 The artists of the above, used the signature “olote” which is derived from Nahuatl word, olotl. 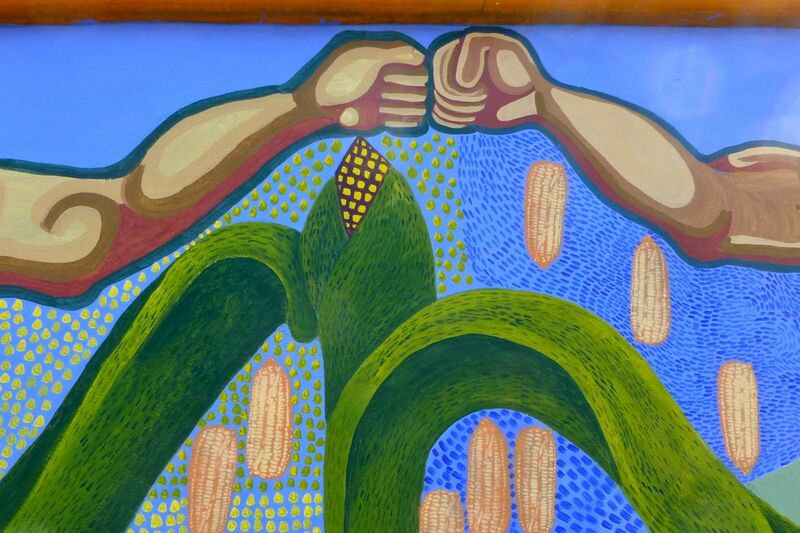 In English, it translates to “corncob” and “a nobody.” Thank you to a couple of “nobodies,” Coral Saucedo and Ricardo Aeme, for such an expressive and beautiful piece of art honoring the sacred corn. I’ve always liked Thanksgiving — and not just because, after I turned 12, my aunt would pour a little red wine in a shot glass for my cousin and me. It’s one of the least commercial US holidays, if one discounts the whole “black Friday” and, now, “brown Thursday” (eww!) phenomenon. And, it isn’t wrapped in flag waving. It’s a day set aside for a communal sharing of Mother Nature’s bounty, counting our blessings, and acknowledging and giving thanks for the assistance of the dark-skinned original human inhabitants of the Americas. What a novel idea! Besides being thankful for my loving and supportive family, wonderful friends (both old and new), dedicated and encouraging blog readers (Yes, you! ), I’m extremely grateful for having the privilege of living among people whose ancestors first cultivated corn in this beautiful valley. 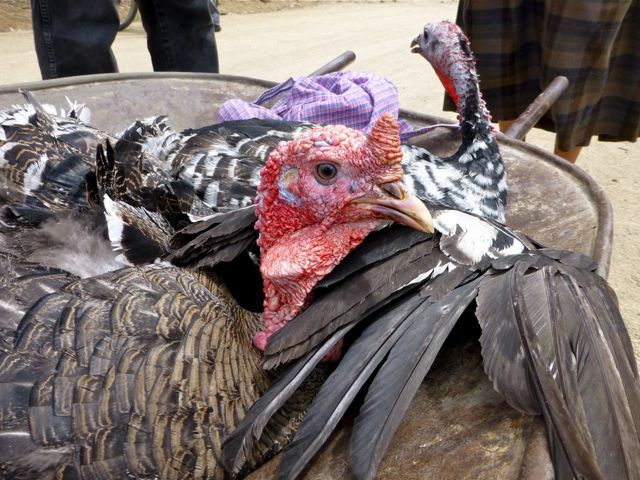 Now off to the kitchen to make the stuffing. ¡Feliz Día de Acción de Gracias! Much like the Mark Twain line, “The report of my death was an exaggeration,” unfortunately, so too the news announcing the death of GMO corn in Mexico. Contrary to reports, genetically modified (GMO) corn has not been banned in Mexico. On October 10, a Mexican judge from the Twelfth Federal District Court for Civil Matters in Mexico City issued an injunction suspending field trails of GMO corn, however, a complete ban was not ordered. Sometime around 8,000 years ago, corn was first domesticated in the valley where I have the privilege of living. 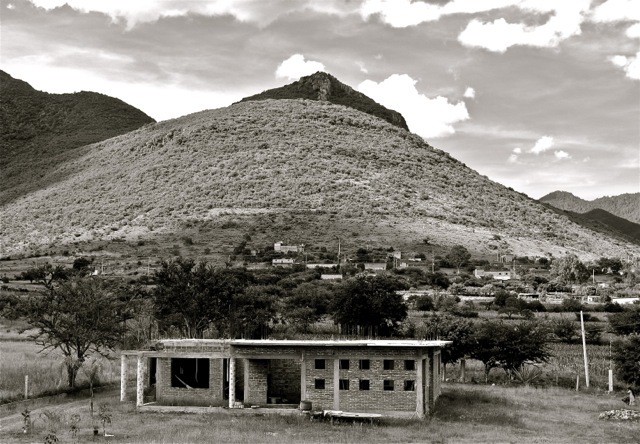 Botanists have determined that the valley of Oaxaca was the “cradle” of maize evolution. 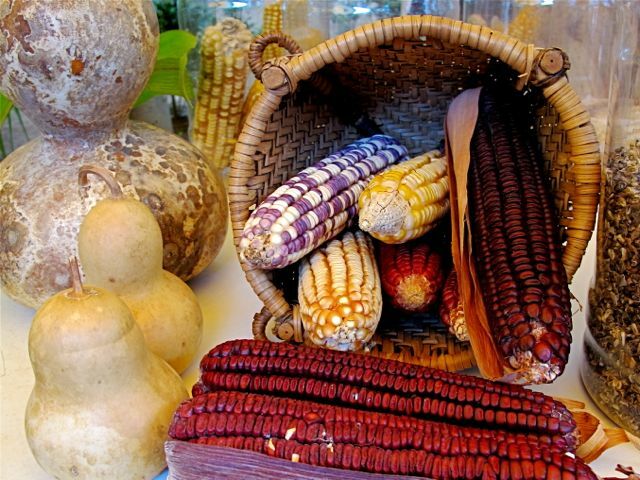 Maíz became the lifeblood of the Mesoamerican diet and culture and it continues today. 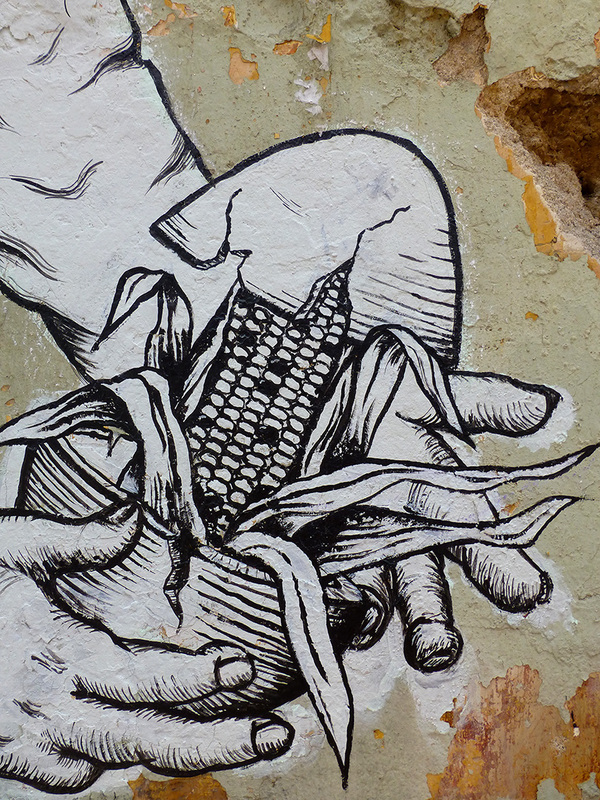 Genetically modified corn is a major issue in Oaxaca. There is a concern that native plants could become infected with GMOs, which would then contaminate and compromise the genetic diversity of native varieties. Speakers, at the event, discussed the importance of the community seed banks that have been established to safeguard native varieties and be used in the wake of economic and ecological crisis. 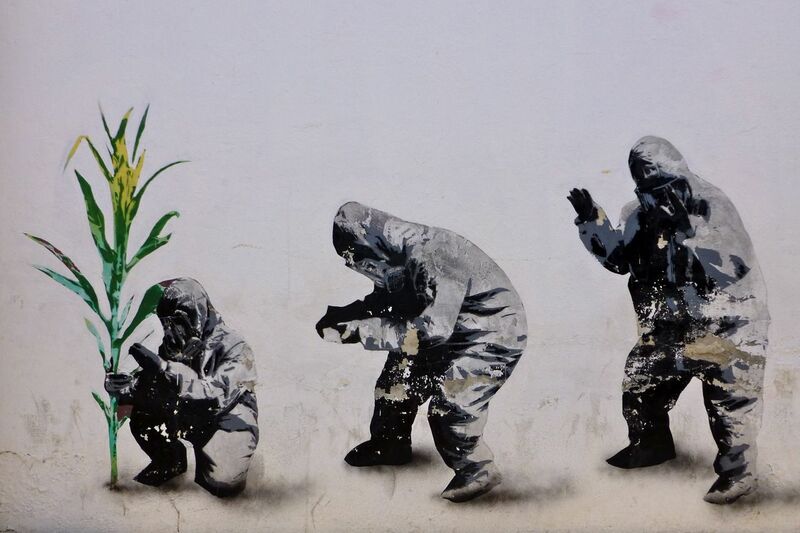 Two weeks after the aforementioned event, there was good news, a Mexico judge has placed an indefinite ban on genetically engineered corn. And so to celebrate, I am re-posting the Lila Downs video of her song “Palomo del Comalito,” paying homage to maíz, and its “granitos de cristal” (grains of crystal). 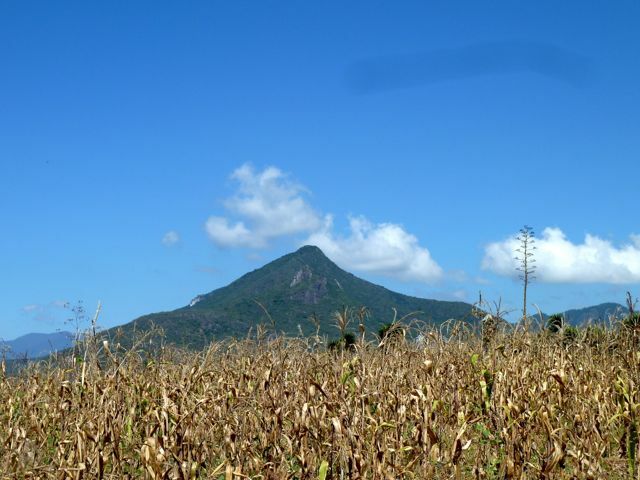 And to bring this post full circle, the video was filmed in Teotitlán del Valle, located here in the valley where corn was first cultivated. Friday, I went Teotitlán del Valle to visit a friend. N is living out in the campo and it was an adventure just getting there — necessitating a colectivo, bus, moto-taxi, and a fair amount of walking. However, it was well worth it! The conversation was non-stop, comida was delicious, and the setting is spectacular. El Picacho from my friend’s rooftop terrace. However, a major topic of conversation in the village is the lack of rain. Granted, I was grateful the creek the 3-wheel moto-taxi and I had to ford only had about six inches of water in it, but looking out from N’s terrace, it was evident the fields are suffering. 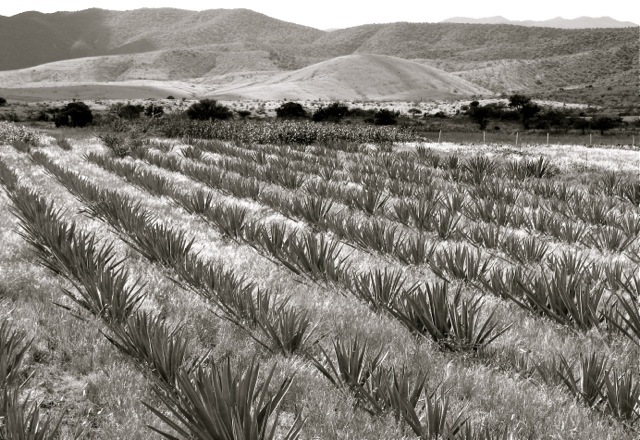 Maguey fields in Teotitlán del Valle. Acres upon acres of parched earth, with rows upon rows of drooping and stunted corn — the lifeblood of this country. When the campo suffers, so too the people. Word has it that this is the driest rainy season anyone can remember. In a normal year, afternoon showers irrigate the fields and clean the city’s streets at least four to five times a week from June through September. This year, nada! I can probably count on two hands the number of times it’s rained. Your offerings and prayers to Cocijo would be much appreciated! Update: Wow, I have some powerful blog readers — it rained last night!!! Mil gracias. 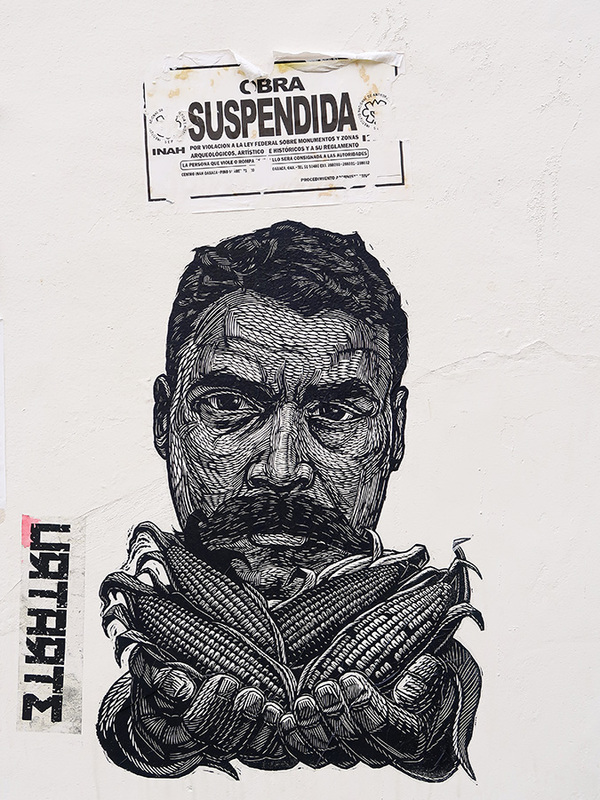 Just the thought of introducing genetically modified corn and the chemicals it requires into Oaxaca, where maíz has been cultivated (Just fine, thank you very much!) for thousands of years makes me sad and angry. Education is growing, opposition is mounting, and alternatives to the profits-before-people-and-the-environment Monsantos of this world are being set up. By the way, “agroecology” is a new word for me… and I like it! 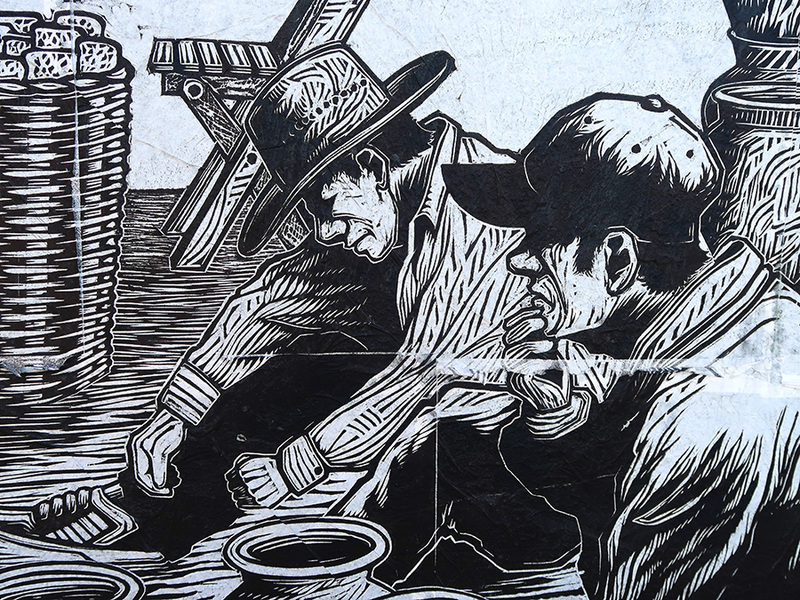 The largely invisible work of small local groups of indigenous farmers in Mexico who are spearheading the defense of their territory and identity and of native seeds is strengthening ecologically sound family farming, experts say. 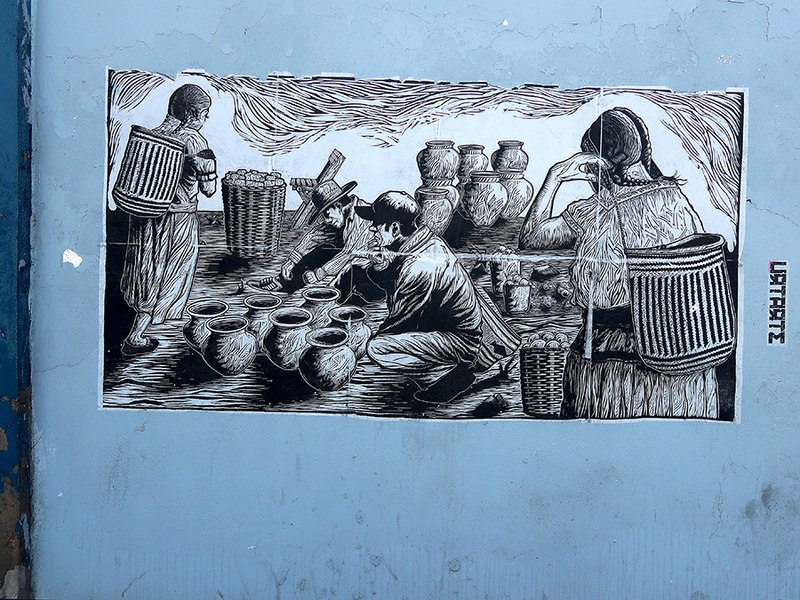 Since 2000, Barrera has worked on mapping Mexican political ecology, a discipline that studies the relationships between political, economic and social factors and environmental issues and changes. “Agroecology is the key, because it encompasses social aspects, education, economics and farming practices,” said Barrera, who has published the results of his studies in the Spanish journal Papeles de Relaciones Ecosociales y Cambio Global (Papers on Eco Social Relations and Global Change).